The Geological Character of the Stonehenge Stones. 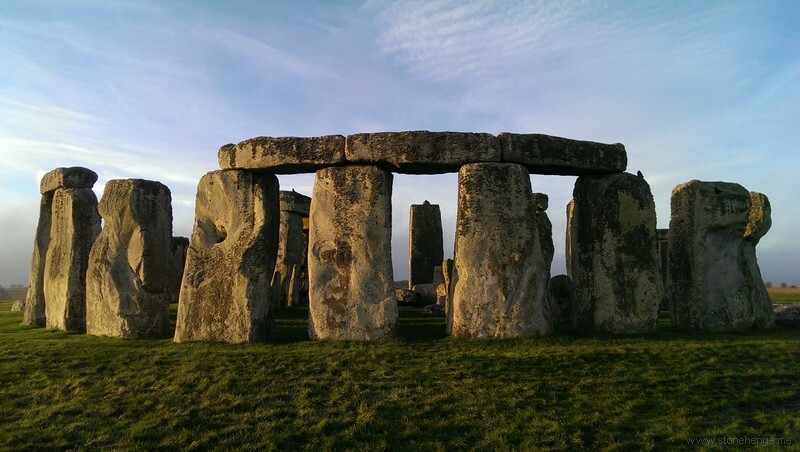 Dr.Stukeley appears to have been the first to notice the difference between the character of the stones composing the inner and outer circles and ellipses at Stonehenge. He says of the stones of the smaller oval that they are of a much harder sort than those of the lesser circle; and were brought somewhere from the West ; and of the (so-called) altar-stone, that "’tis a kind of blue coarse marble such as comes from Derbyshire, and laid upon tombs in our churches and churchyards." Before Aubrey's time there appears to have been a prevalent opinion that the stones were " factitious." 1 To those who were not acquainted with the valleys in the neighbourhood of Marlborough, these stones would be unlike any with which they were familiar; and the "composition" of them, where they stand, would get over any difficulty about their transport thither from a distance. The appearance, too, of some of the stones, such as of that which forms an impost of the outer circle towards the north-west, and which in its upper portion was found to consist, for the depth of a few inches, of a conglomerate of flints and sand,2 may have given strength to this opinion. There appear to have been, even recently, according to a paper of Mr. Cunnington's in 1865, some very curious notions about the sarsen portion of the Stonehenge stones. In 1836, the President of the Architectural Society had discovered, "from recent inspection, that the large stones of Stonehenge were in their granular character, closely allied to the marble of Carrara,' and another careful visitor of Stonehenge was of opinion that the stones were artificial. Mr. Sowerby, in 1812, describes the stones thus: " The outer circle and the great trilithons, with their imposts, are of sarsen3 stone, a fine-grained silicious sandstone.
" The stones of the smaller circle (except Nos. 9, 11, 17, 19, in Sir. R. Hoare's plan) are an aggregate of quartz, felspar, chlorite and horn-blende.
" No. 9 is silicious schist. "Nos. 11, 17 19 are hornstone, with small specks of felspar and pyrites.
" The altar-stone is a fine-grained micaceous sandstone." The Rev. W. D. Conybeare, in the Gentleman’s Magazine, vol. ciii., part. 2, p. 452, thus speaks of the small circles : " Each stone a variety of greenstone rock which occurs nowhere nearer than the environs of Dartmoor in the West, or Charnwood Forest in Leicestershire on the North ; — either being a distance of full a hundred miles in a direct line." Mr. Charles Moore, F.G.S., of Bath, in 1865, expressed his belief "that the nearest point at which they could find similar material was Wales, or possibly Shropshire, although he found stones of precisely similar character while exploring the Mendips a few months ago, but the stones could not have been obtained from that spot, for the rock had never been worked." " Oxford, 22nd December, 1858.
" 1. Marked Stonehenge altar. This is a gray sandstone, composed of quartz sand, silvery mica, and some small dark grains (possibly hornblende). Such a stone might be obtained in the gray Devonian or gray Cambrian rocks — and in other situations (' Cos.' antiq).
" 2. Greenstone (Anglice). Composed of slightly quartzose Felspar — horn-blende — a little chlorite ? &c., &c. This is an ordinary greenstone of such large grain and such, a constitution as to make approach to the green syenite of some writers. If I had better specimens I could perhaps determine the presence of other minerals. Such a rock may be found in dykes in Devonshire, in dykes and seaming beds in Wales, &c.
" 3. Smaller specimen, like the last, but with finer grain. "4. Compact felspar of Mac Culloch: shows no internal crystallization; base of many dark porphyries — such occur in North Wales, Cumberland, &c. If on the spot, we were to study more carefully the several stones, it might, I think, be possible to identify the greenstones ; but by such little atoms as these only guesses and those very vague can be justified.
" There is nothing like granite in the specimens. This rather points to Wales than to Cornwall — nor is there any ordinary (felspathic) elvan as in Cornwall, but 'Elvan' is a name applied to greenstone dykes not unlike this stone near Dartmoor. But as, no doubt, Merlin brought the stones he might choose a rock now buried in the great depression of Caernarvonshire, where Sara Badrig alone remains to mark his tram-road ! But upon this subject, there is no one who deserves a hearing, and a more attentive hearing, too, than Mr. Cunnington, F.G.S., who has devoted so much time and thought to the study of the geological character of the Wiltshire megalithic structures. He says, in a paper " on the geology of Stonehenge," read at the Salisbury meeting of the Wilts Archaeological Society, 1865: " We are in- debted to Mr. Prestwich, the treasurer of the Geological Society, for the exact determination of the stratum from which the 'Sarsens' are derived (Vide Journal of the Geological Society).
" At the close of the secondary period of geologists, when the Chalk stratum, now forming the downs over which we shall walk to-morrow, was at the bottom of the sea, beds of sands, clays, and gravels, were deposited upon it. These constitute what are now called the tertiary strata. When they were subsequently raised above the bed of the ocean, they were exposed to the powerful de- nuding action of seas, glaciers, and rivers, by which the main portion of them, in the western district (Wiltshire included), was carried away ; a few cappings on some of the hills only remaining through the greater part of our county. Such cappings are not uncommon on some of the high hills on the borders of Salisbury Plain, es- pecially to the northward and eastward of Amesbury, and between that town, Bedwyn, and Kingsclere ; whilst hills, where no masses of tertaries remain, shew by the presence of numerous tertiary flint pebbles on their summit, the wreck of strata once spread over this area. Among the lower tertiaries (the Eocene of Sir Charles Lyell), are certain sands and mottled clays, named by Mr. Prestwich the Woolwich and Reading beds, from their being largely developed at these places, and from these he proves the sarsens to have been derived; although they are seldom found in situ, owing to the destruction of the stratum to which they belonged. They are large masses of sand concreted together by a silicious cement, and when the looser portions of the stratum were washed away, the blocks of sandy rock were left scattered over the surface of the ground. "At Standen, near Hungerford, large masses of sarsen are found, consisting almost entirely of flints, formed into conglomerate with the sand. Flints are also common in some of the large stones forming the ancient temple of Avebury.
" At the cliffs of St. Marguerite, near Dieppe, is a bed of fine white sand, reposing unevenly upon the chalk, and extending for one or two miles in length. It contains blocks of concretionary silicious sandstone, frequently measuring many feet in length. A good example of sarsen stone in situ.
" The abundance of these remains, especially in some of the valleys of North Wilts, is very remarkable. Few persons who have not seen them can form an adequate idea of the extraordinary scene presented to the eye of the spectator, who standing on the brow of one of the hills near Clatford, sees stretching for miles before him, countless numbers of these enormous stones, occupying the middle of the valley, and winding like a mighty stream towards the south.
" In some places, they strew the ground so thickly, that across miles of country, a person might almost leap from stone to stone, without touching the ground on which they lie, and some of them are four or five yards across. Sometimes the masses are formed of unusually fine sand, and the result is a very dense hard rock. In this variety are commonly found the remains of what appear to he fucoids or sea weeds. They do not exhibit any very marked structure, hut are certainly vegetable. With regard to the origin of the stones composing the small circle and inner oval of Stonehenge our in- formation is less definite. They differ entirely from the sarsens, being all primary or igneous rocks. Professor Tennant, of King's College, has favored me by making a fresh examination of the speci- mens. With four exceptions, they are of syenite, composed of quartz, felspar, and hornblende. One of the exceptions is silicious schist, and the other three greenstone, containing small crystals of horn- blende and iron pyrites, the latter partly decomposed, and passing into oxide of iron. The altar-stone is a fine-grained micaceous sand- stone. Professor Ramsay, of the Geological Survey, says : 'They are certainly not drifted boulders, and do not resemble the igneous rocks of Cham wood Forest ; and without asserting that they came from Wales or Shropshire, I may state that they are of the same nature as the igneous rocks of part of the Lower Silurian region of North Pembrokeshire and of Caernarvonshire.
" Professor Tennant says that Charnwood Forest contains several kinds of greenstones and syenite, but that he never saw any of them like the stones of Stonehenge. They bear, however, he thinks, a strong resemblance to those of the Channel Islands, and it has always appeared to him that they were obtained from that source.
" But the most important consideration connected with the smaller stones, and one which in its archaeological bearing has been too much overlooked, is the fact of their having been brought from a great distance. I expressed an opinion on this subject in a lecture delivered at Devizes more than eighteen years ago, and I have been increasingly impressed with it since. I believe that these stones would not have been brought from such a distance to a spot where an abundance of building stones equally suitable in every respect already existed, unless some special or religious value had been attached to them. This goes far to prove that Stonehenge was originally a temple, and neither a monument raised to the memory of the dead, nor an astronomical calendar or almanac. In either of these latter cases there would have been no motive for seeking the materials elsewhere. The sarsens would have answered every purpose, with less labour, and with better effect. But, if these were the sacred stones of some early colonists, a superstitious value would have been attached to them, and great care and labour bestowed on their preservation. Thus the ancient so-called ' Stone of Destiny,' on which our sovereigns are crowned, was preserved with pious care for centuries in the Abbey of Scone, and has, to this day, its place in the Coronation Chair at "Westminster Abbey.
" It has been suggested that they were Danams, or the offerings of successive votaries. Would there in such case have been such uniformity of design or would they have been all alike of foreign materials? I would make one remark about the small impost of a trilithon of syenite, now lying prostrate within the circle. One writer has followed another in taking it for granted that there must have been a second, corresponding with it, on the opposite side. Of this there is neither proof nor record, not a trace of one having been seen by any person who has written on the subject. This small impost, not being of sarsen, but syenite, must have belonged to the original old circle, and it may even have suggested to the builders of the present Stonehenge the idea of the large imposts and trilithons, with their tenons and mortices.
" It is important to mention that no iron implements have been found in the numerous barrows around Stonehenge." 1 The author of a " Fool's Bolt '' strongly asserts their being saxa factitia, as " it was impossible to work them into their several forms. Free-stones may be wrought to any, but these churlish stones to no form in cause of hardness and brittleness." 2 See Wilts Magazine, vol. xi., p. 348. Mr. Cunnington adds to this account, the following statement : " Masses of sarsen made up entirely of a similar conglomerate of chalk-flints frequently occur in the neighbourhood of Standen, near Hungerford, but they are not found in the middle or southern districts of Wilts." 3 In the Addenda and Notes to " Abury Illustrated," the following is given as an explanation of the word " Sarsen : " " The term Sarsen, or Saresyn, was applied by the Anglo-Saxons, simply in the sense of Pagan, to the stones which they found scattered about the Wiltshire Downs. As all the principal specimens of these mysterious blocks were perceived to be congregated into temples popu- larly attributed to heathen worship, it naturally came to pass that the entire formation acquired the distinctive appellation of Sarsen or Pagan stones. The same epithet of ' Saresyn ' the Saxons also applied to their invaders the Danes or Northmen, who, on their coming into this country, were universally pagan. Thus Robert Ricart (quoted in Roberts' History of Lyme) says, ' Duke Rollo Le Fort was a Saresyn come out of Denmark into France ; ' and a spot in Guernsey is still designated by the same term from having constituted the temporary stronghold of certain Norman freebooters." — Waylen's History of Marlborough, p. 529. The following is from Mr. Henry Lawes Long's ' ' Survey of the Early Geography of Western Europe : " " In addition to the suggestion advanced that our word Sarsen, as applied to the Druid sandstone, is, in fact, a corruption of Saracen, I may add that Sarrasin is the name commonly given on the Continent to ancient objects whether of Celtic or Roman construction, thereby inferring a period anterior to any remains of Christian origin. Roman denarii, which in the north of France still occasionally are current as sous, bear the name of Sarrnsins. The Roman bridge near Aosta is called the Pont de Sarrasins." And I may add the following extract from the " Journal de I'Architecture," (of Brussels,) 4"". annee, p. 84 : " Les traditions locales attribuent la con- struction des chaussees romaines aux Sarrasins. Les mines, les tuiles antiques, les poteries, les medailles, etc., que Ton trouve chaque jour, ne sont connus, comme on salt, que sous les noms de Masures, de Vahes, de JiJonnaies, ou de puits des Sarrasins, Cette denomination remonte evidemment aux temps des Croisades, lorsque les esprits etaient remplis du nom des infideles. Du reste, les armees et les populations qui revenaient de Terre-Sainte, en suivant les chaussees romaines, n'auront pas peu contribue a repandre aux environs I'epithete injurieuse de Sarrasin et de payen, dans laquelle ils auront confondu les Romaines si, comme il est probable, un faible souvenir de ce grand peuple vivait encore a cette epoque dans le souvenir de nos peres." Mr. Long quotes the following from Col. Symonds's Diary, which his cousin, Mr. C. E. Long, edited for the Camden Society: " 12"' Nov. 1644, Tuesday, though a miserable wett windy day, the army moved over the playnes to Marlingsborough, where the King lay at the Lord Seymour's howse, the troopes to Fyfield, two myles distant, a so full of a grey pibble stone of great bigness as is not usually seene ; they breake them, and build their howses of them and walls, laying mosse betweene, the inhabaitants calling them Saracen's stones, and in this parish a myle and halfe in length, they lye so thick as you may goe upon them all the way. They call that place the Grey -weathers, because a far-off they looke like a flock of sheep”. 4 These stones are now rapidly disappearing ; they are used for building purposes.